Are you trying to help your child to learn the alphabet? Is she getting oh-so-bored with tracing letters on a piece of paper or pointing to them in books? I’m not saying that these, and similar types of, activities don’t have their place in A-B-C learning, but sometimes you simply need to up the excitement factor. When my son was in kindergarten his teacher really, really, really loved giving them tracing worksheets for alphabet practice. Every week he toted home a new letter that he had to sit and trace, and trace, and trace and then trace some more. Sure, he could identify and write the alphabet, but he was bored. While you don’t need to curtail writing or tracing exercises, you can add this super-sized letter sculpture project in to the mix. I used regular round balloons (taped together) to create the letter form. My original plan was to use the long hot dog-like ones that the balloon guys use to make those amazingly intricate little doggies and hats at the school carnival, but I just couldn’t manage to blow up the ones that I bought. If you can find a brand that works for you, by all means try it as a substitution. I also used rolled plaster sheets for this project. If you don’t feel comfortable with the dust that plaster releases, or your child is especially sensitive, swap them out for a simple paper mache paste (you can buy a mix or make your own with white school glue and a touch of water) and construction paper strips. 1. Choose a letter. Go with your child’s first letter (for example, “L” is for Lisa) or pick a letter that you are currently working on learning. 2. Blow up enough balloons to make your letter. I used five grapefruit-sized balloons to make the letter “L”. 3. Tape the balloons together to form the letter. 4. Prep your work surface. Cover your table with a plastic garbage bag, tarp or something that won’t break apart when it gets wet (i.e., don’t use newspaper). 5. Cut the plaster into strips. 6. Fill a container with warm water. 7. Dip the plaster strips (one at a time) into the water. If you are using paper mache, dip the paper into the paste. 8. Cover the balloon letter with the plaster/paper mache strips. Make sure that your child completely covers all of the balloons. She can add an extra layer just in case. Even though this will take some time (probably overnight) to dry, you want a hard shell that will keep its form when the balloons eventually deflate inside. 9. Let the plaster/paper mache completely dry. 10. Paint the letter. Your child can choose one color or several for a rainbow pattern, polka dots or her own mix and match design. Have her paint one side, let it dry, and then flip the sculpture over to complete the other side. When the letter is done, make more. Create an entire over-sized alphabet or have your little one make her own name out of letter sculptures. 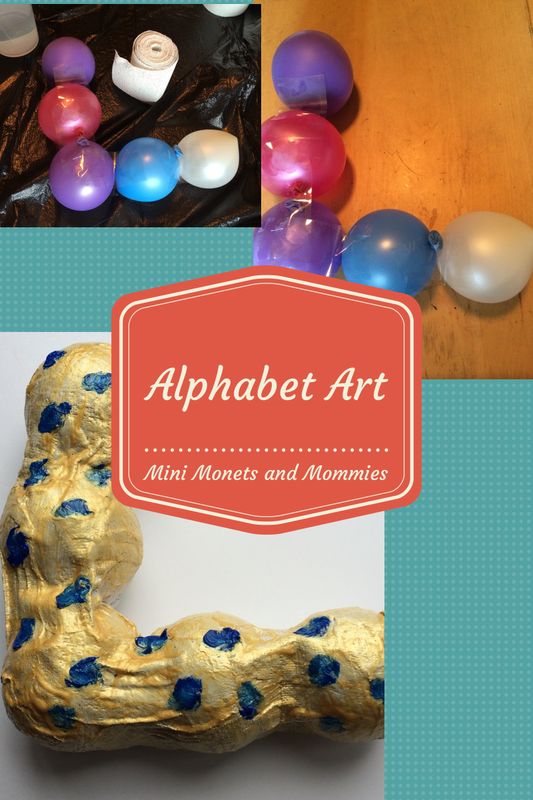 Are you looking for more alphabet art activities? Follow my Pinterest board for ideas! Wow what a fun idea. Giant letters! I love it. We've done a couple of papier mache projects with single balloons before, but I never thought of putting them together to make letters. I love this! My 4-year-old is working on learning to write letters, which i feel like is really a kinetic experience, so this is really perfect. You are creative! The kids probably had fun helping to make these letters! You are so creative!! I am very impressed and I look forward to trying some of your art projects (like the rain one you recently posted) with my kids! !